range : m 3 to m 50 or 1/8" to 2"
length : 10mm to 100mm or 3/8" to 4"
SAN EXPORTS WORKS was established in the year 1960 in Punjab (India). The company is a Sister Concern of S. S Engineering Works. Mr. Sandeep Gupta, the experienced CEO of the enterprise, has dedicatedly worked to take the company to the sky-scrapping heights in the industry. 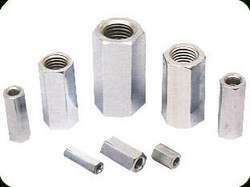 Therefore, the company is known as the prominent Manufacturer and Exporter of Forgings, Fasteners, Tractor Linkage Parts, Tractor Parts, Machine Component, Bolts, Nuts, Linkage Pins, Levers & Linkages, Pipe Flanges, Fastener, Sleeve yoke, etc.